Once our seeds have germinated they are reliant on us to ensure a steady supply of water and food. 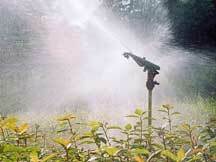 We must also keep them free from weed competition and any pests and diseases that may threaten their growth. Our native trees do not like high temperatures, but they will benefit from a certain amount of protection from the elements. If grown in containers, this can be achieved by placing the pots on a windowsill, in a polytunnel or another such place. Wherever they are though, please ensure that they receive plenty of bright light. Otherwise they will grow weak and spindly. If they are grown in seedbeds, there is no option but to grow them outside, unless you are lucky enough to have a greenhouse or polytunnel. Too much water can be as damaging as too little to our young trees, especially to those grown in containers. Obviously, we have less control over the amount of water our trees receive outside and we must hope that Mother Nature sends us just about the amount we would ask. We can add extra when she doesn’t send enough, but must hope that our soil is well-drained enough to cope with those times when she is a little ‘over generous’. 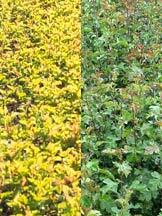 Competition from weeds can seriously reduce the growth of our trees. Weed growth in containers can be kept to a minimum if sterile compost is used, but take care to remove any weeds that do appear! They will grow very quickly, especially when the pots are undercover. Weed growth outside will be slower, but they will inevitably overtake and possibly smother our trees if they are given the chance. 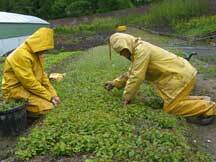 Weeds are best carefully removed when they are very small. This will cause the minimum disturbance to the trees’ delicate roots. The photograph on the right shows, quite starkly, the difference between young hawthorn seedlings that are short of food (on the left) and those that are well-fed (on the right) – and these are real photographs! Plant nutrients in the soil can quickly ‘leach’ with heavy rain leaving plants short of food. While they may recover as their roots develop, they will have suffered a setback for that year, resulting in smaller seedlings. The best way to feed plants is to do it indirectly by feeding the soil. Due to leaching or a high demand from many seedlings, this may not always be adequate. As a supplement there are many proprietary brands of fertilizer available, organic and inorganic. Our trees require a well-balanced fertilizer to be applied little and often (perhaps every 4-6 weeks). This may be in the form of a liquid feed (particularly good for containers) or granular, which will leach more slowly. Never apply more than is recommended as this can damage the plants’ roots and have an adverse effect on our environment. Perhaps the biggest threat to the health of our young trees is that from pests and diseases. These can strike at any time – from before seed germination all the way through to mature plant. The amount of damage they will do generally depends on the overall health of the plants being attacked. A healthy plant can resist pests and diseases far better than an unhealthy one. How we treat pests and diseases will depend on our general approach to gardening. Organic gardeners will have fewer methods of control at their disposal than do gardeners who are prepared to use pesticides. Garden centres should stock a range of treatments, both organic or otherwise, that we can use once we have identified the problem. But, keep your eyes wide open! The earlier we spot any kind of problem, the earlier we can treat it and the more effective the treatment will be. Check out the Garden Organic for organic solutions.